Woodend Barn in Auchterarder sleeps 4 people. 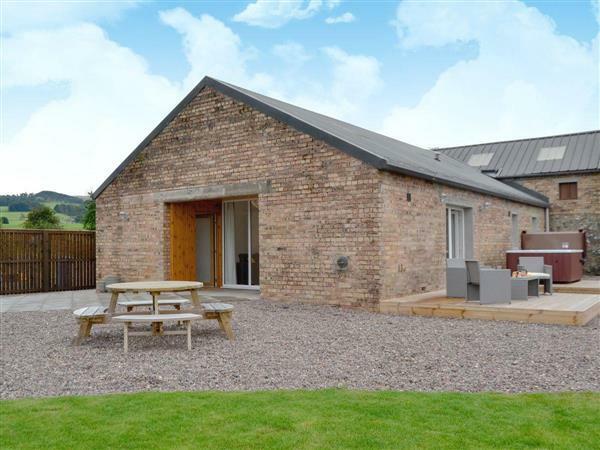 Woodend Barn in Auchterarder is a detached barn conversion in rural Perthshire, which is just a short drive from Auchterarder with its 1½-mile long high street lined with a splendid selection of eateries and bespoke shopping. Woodend Farm Barn nestles close to the owner’s home on Woodend Farm, now a 10-acre smallholding where Highland cattle and sheep graze. It was built well before the railway line, which is spanned by two beautiful bridges on the edge of the farm garden. For many years, the farm operated as an 80-acre pig farm, but in 1999, a 10-acre section was sold off and the new owners completely transformed it. The farmhouse remained, but many of the sheds were taken down to leave just a small section, which was turned into stables. When the current owners took over in 2009, the barn itself was initially used as a machinery store and then a lambing shed, the barn has now been converted into a holiday home with a private hot tub, where guests can relax in the evening with a glass of wine in hand. Woodend Barn in Auchterarder is immaculately-presented and provides spacious and contemporary accommodation; Woodend Farm Barn enjoys uninterrupted views of the miles of beautiful Perthshire countryside. This property is in an ideal location for relaxing with friends and family, and enjoying the area with all it has to offer. Gleneagles Golf Course and Auchterader Golf Club are close by, making it an ideal location for golfers, as well as an excellent base for exploring the countryside with its abundance of walks, cycling, fishing, Whisky distilleries, castles and historic homes and gardens. Crieff, Perth and Stirling are only a short drive away, and just over an hour’s drive from the heart of Glasgow and Edinburgh. The local railway station provides links to all major towns and cities. Alternatively just relax in the garden and enjoy the views, either in the hot tub, or from one of the outside seating areas which the owner has positioned to catch the best of the sunshine. The shop, pub and restaurant are 1½ miles from Woodend Barn in Auchterarder. Woodend Barn is all on the ground floor. 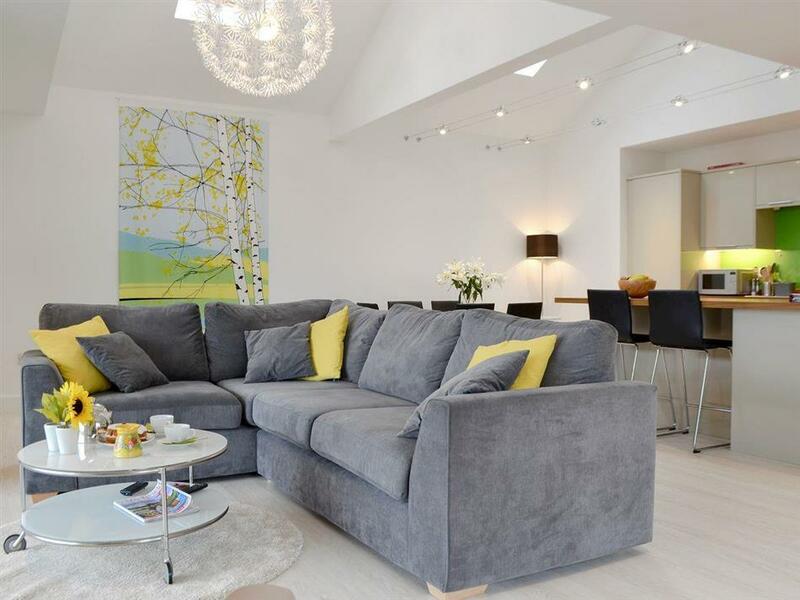 Living area: With 43 Freeview TV, Blu-ray player, CD player and patio doors leading to garden. Bedroom 1: With king-size bed and en-suite with toilet and heated towel rail. Oil underfloor central heating, electricity, bed linen, towels and Wi-Fi included. Travel cot and highchair. Welcome pack. Large enclosed lawned garden with decked area, garden furniture and gas barbecue. Private hot tub for 5. Bike store. Private parking for 2 cars. Wheelchair access. No smoking. Holidays at Woodend Barn run from Friday to Friday. Pets allowed at Woodend Barn. For a better idea of where Woodend Barn is, you can see Woodend Barn on the map below. Woodend Barn is in Perthshire; should you be on the lookout for a special offer, you can find all the special offers in Perthshire. It's always worth checking to see what is on offer at the moment. Do you want to holiday near Woodend Barn (UKC855), you can see other cottages within 25 miles of Woodend Barn; have a look to find your perfect holiday location.